Looking for an alternative preschool for your child? Juguemos offers an excellent Total Immersion pre-school program for your 2 years to 5 year old. As part of our Total Immersion approach, children will be taught entirely in Spanish. Our curriculum is designed to provide developmentally appropriate activities and experiences to children. 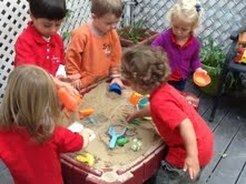 Play, real life experiences, and teacher-led experiences are the primary ways children will learn. The Program runs ALL YEAR LONG (SEPTEMBER through JUNE with OPTIONAL SUMMER PROGRAM from JULY through AUGUST). Groups are small to encourage one on one interaction with the teachers. Early drop off (8am) and Extended Day (3-5:45pm) are also available.